Whenever we talk about melasma immediately Cosmelan and Dermamelan come to the conversation as the divine solution for the dark spots. But are they really a solution? What are so special about these two treatments, which though expensive are the best selling products in the market? Will be effective in all dark spots? They may be used by all people? We will all have the same results? 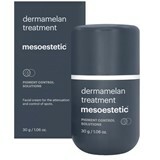 To try to know EVERYTHING about these two treatments we contacted Mesoestetic to realize what the differences between the Cosmelan and Dermamelan. And the result was a super interesting and very enlightening conversation! But what do they really do? 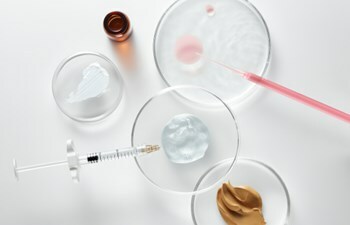 These treatments result from a combination of depigmenting ingredients that act on cells responsible for coloring the skin in order to model the exacerbated production of melanin (the pigment responsible for spots), with peeling ingredients that will attenuate existing spots in the surface layer of skin, by increasing cell turnover and rejuvenating the skin. It seems a bit like all the other anti-dark spots treatments on the market do, right? WRONG! 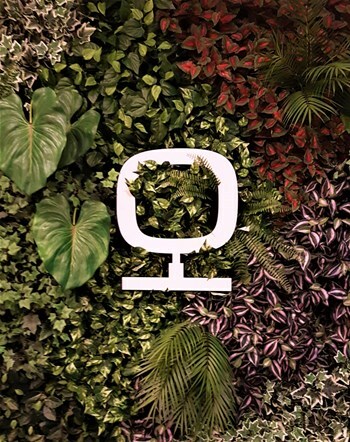 The fact is that the Cosmelan and Dermamelan are professional treatments comprising two stages of treatment, including the application of the first phase in a medical or cosmetic office, and the subsequent use of a home maintenance cream for a period of at least 7 months. And the results are plain to see: in 99% of cases with abnormal spots or hyperpigmentation of epidermal location, the process of attenuation or disappearance of spots reaches 95% efficiency! It is the case to say that these gentlemen do not mess around, do not you think? 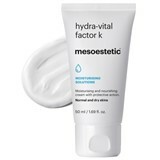 Now we're a little more at ease with Cosmelan and Dermamelan let's talk about Mesoestetic and try scrutinize a little more this subject (eh eh eh!). 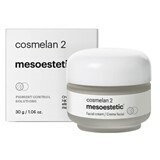 The Cosmelan and Dermamelan are cosmetic treatments with two phases: the first held in cabin by a qualified professional, which applies Cosmelan1 or DermamelanMask, properly and adjusted to the type and spot extension, sensitivity and skin type and skin condition of each person; the second stage, maintenance, is performed at home through daily application of Cosmelan 2 or Dermamelan Treatment, in combination with complementary treatments such as Melanogel Touch, Hydra Vital Factor K, Moisturising Sun Protection, etc. Followed by monitoring visits to the aesthetic professional or the doctor who applied the treatment. This control and professional follow-up are essential to the success of treatment, as well as discipline in the implementation of home maintenance treatments. The Cosmelan 2 is a depigmentation maintenance cream for use at home after the application of peeling Cosmelan Pack in aesthetic cabine. The Dermamelan Treatment cream is also depigmentation of home maintenance but whose concentration of ingredients is higher and therefore its use is dependent on a prescription and the appropriate peel is applied only in medical office. The effectiveness of Cosmelan depigmentation treatment depend on various internal and external factors of the consumer, which should be evaluated by a professional. The correct application of the products according to laboratory protocol, performed by a professional, and their proper monitoring and home maintenance are essential for successful treatment. It is intended primarily "mitigate" the spots. We recommend that you always evaluated by a specialist in the area, so the diagnosis is the most adapted to each individual case. Depigmenting treatments are not combinable with sun exposure. Which means that, it is sun exposure, will have spots (more pronounced or less pronounced). 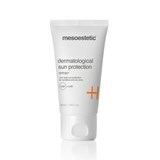 Which means that if you make sun exposure, you will have spots (more pronounced or less pronounced). application of home treatment (Cosmelan 2 or Dermamelan) by the client in accordance with the professional guidelines or brand. It is important to emphasize that it is totally inadvisable and contraindicated the application os CosmelanPack in the home environment without the accompaniment of a professional - medical or aesthetic! Before applying these treatments, evaluation and diagnosis of skin is critical, and only after preparation and application of these steps according to the protocol it is possible to apply the Pack. It is important that the protocol is complied with, in order to obtain the desired results! The protocol is presented to doctors and health professionals, provides important specifications, such as the correct amount of product to be applied on face per cm2 in order to obtain results. Or the number of hours the mask should stand in the face without compromising the sensitivity of the skin. These treatments can be done throughout the year. Taking due care with sunlight and heat sources directly on the face. It will be more comfortable doing the treatment after the summer as the risks are lower for re-pigmentation. Skin exposed to the sun = spots and aging. No. Depending on the threshold of tolerance of each skin, the skin type we are dealing with and the history and treatments that the skin has already been subjected, it can be felt several different reactions. Blushing and burning on the face are normal in the first days of application, and are not of concern, although it can be very intense reactions. This feeling will disappear with treatment days. It is important to note that the areas near the mouth and nose (nasogenian), are the most sensitive areas and may flake off or burn excessively, causing discomfort reactions, but which are normal and fully provided by the laboratory. The skin when peels also may develop micro-cracks that with the application of maintenance products at home (Cosmelan and Dermamelan) promote burning. However it is important to mention that the peeling depends and varies from person to person and, above all, if the person already made prior treatments. Every realization of the treatment, the skin of each person may react in different ways, peeling and blushing very little or nothing. This does not mean that the treatment is not being effective, simply the process of skin renewal is standard, and as such the scaling is more mild or almost imperceptible. The duration of treatment should be defined by the professional responsible for the treatment, taking into account the diagnosis of skin. However Cosmelan or Dermamelan treatment should never be less than a period of seven months. In the first or second week after initiating treatment with Cosmelan can already be observed a remarkable improvement of the skin. Sensing is the reduction of spots and treated in parallel is observed the appearance of a brighter and rejuvenated skin. Avoid direct sunlight or any heat source: saunas, Turkish bath, uncapping pots, open ovens, etc. Drink plenty of water to rebalance water loss through the skin.